1. In the bowl of a stand mixer, beat butter and cream cheese until fluffy and light and has increased in volume, about 5 minutes on medium speed. On low speed, add flour, sugar and salt. Beat until just combined. 2. Divide dough into two halves. Shape each half into a rectangle about 1-inch thick and wrap in plastic wrap. Chill dough in refrigerator for at least 3 hours or up to 2 days. 3. Preheat oven to 350F. Line a 9 x 13 x 2-inch baking pan with parchment paper. Make the paper a little longer so you have a 2-inch overhang to use a handles to help you lift your baked goodies out of the pan. 4. 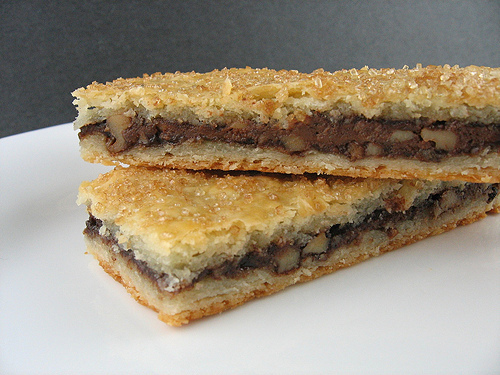 Make the filling by mixing chopped nuts and Nutella. Set aside. 5. In a separate bowl, lightly beat the egg yolk with the water and set aside. This is your egg wash.
6. Take one piece of chilled dough out of refrigerator. If it’s too firm to roll, let it sit on the counter for about 10 minutes. Place dough between two 9 x 13-inch pieces of parchment or waxed paper. Roll dough into a rectangle the size of the bottom of the baking pan. Line the bottom of your prepared baking pan with the dough. 6. Spread dough evenly with the Nutella- nut filling. Roll out the remaining half of dough and place on top of the filling. Trim the edges of the dough so they are even. Brush the top of dough lightly with egg wash. (Most likely you will not use up all the egg wash.) Sprinkle dough evenly with turbinado sugar. 7. Bake at 350F until golden, about 30-35 minutes. Cool completely in pan on a cooling rack. Remove from pan and slice into 24 rectangles.